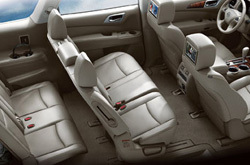 Please look below the video to begin reading a full review of the 2013 Nissan Pathfinder. Stop worring about your next Nissan purchase; look to the chief Pathfinder dealer in Albuquerque for well researched reviews authored by automotive enthusiasts. As you read this article, you'll see that it is filled with helpful information on all of the things you'r looking for in the new Pathfinder. 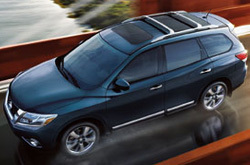 Read on to see if the 2013 Pathfinder should be parked outside your home. Compare the 2013 Nissan Pathfinder head-to-head with vehicles like the 2013 Ford Flex, GMC Acadia, Dodge Durango, Mazda CX9, Chevrolet Traverse and the Ford Explorer, and you'll notice that the Pathfinder wins over the competition in gobs areas. Look over our Quick List below to find out why! Unlike chain auto centers, our Albuquerque car repair facility offers authentic OEM parts, fantastic Nissan trained technicians and a 12-month long warranty for all repairs. We're also conveniently set near a plethora nearby cities. Nissans in Albuquerque can take a pounding, so turn to the auto repair specialists in Albuquerque - Reliable Nissan. We will manage a situation as simplistic as an oil change, or complete intricate auto repairs and service like timing belt replacements, strut and shock repairs and Nissan transmission rebuilds. Reliable Nissan is your choice in Albuquerque for quick, professional Nissan service and regularly scheduled maintenance. For useful savings, check out coupon specials at the next link.